A new study from Australia called SMILES, published in BMC Medicine, demonstrates that putting adults with “major depressive disorder” on a Mediterranean-style diet can ease their symptoms. And the benefits are on top of what you can expect from medication and/or psychotherapy alone. After just three months, remission of major depression was observed in one-third of study participants who followed this diet, while only 8 per cent of people who were given regular social support instead (also known to be helpful for depression) managed to recover. Healthy, balanced plant-based diets may provide benefits by targeting multiple mechanisms, including brain plasticity, gut microbiota, inflammation and oxidative stress pathways, so psychiatrists are now beginning to include nutrition in their treatments. Although many versions of healthy diets exist, evidence from observing population groups suggests that people with a high intake of unproces­sed plant foods have a reduced risk of depression. But those with diets including highly processed foods and sugary products are at increased risk. For example, a review of multiple studies of adults has shown that sticking to a Mediterranean-style diet is linked with a 30 per cent reduced risk of depression, whereas regularly eating foods high in saturated fat and refined carbohydrates is associated with poorer mental health in adults, adolescents and children alike. Avoid fast foods, confectionery, processed snacks and refined bakery goods. Quince is an ancient fruit used widely around the Mediterranean. 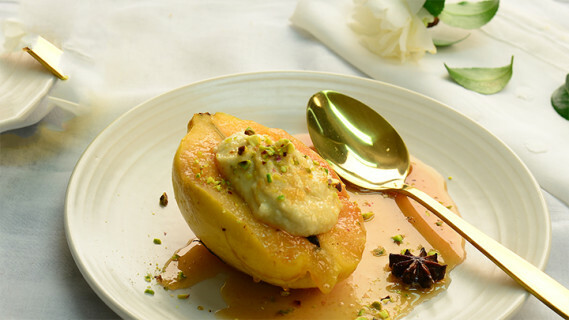 The tannins that make raw quinces unpalatable are responsible for the transformation in colour when preparing this stunning rosy Turkish dessert. Place the lemon juice, honey, spices and 1 litre of water into a wide, shallow pan and bring to the boil. Meanwhile, wash the quinces well. Use a cleaver to cut into halves. Leave the seeds and core, as they will help thicken the syrup into a jelly due to their pectin content. Using a slotted spoon, transfer the quince halves to a plate. Reduce the liquid by boiling on high heat without a lid for 20–30 minutes until it forms a thin syrup. Add back the quince halves, face down, and continue cooking for a further 10 minutes or until the syrup thickens and turns a rosy colour. Remove quince halves from the syrup immediately and place cut side up on a serving plate then drizzle with the syrup. A dollop of cashew nut cream with some ground pistachios on top makes a delicious garnish. Quinces brown quickly when cut so you need to work quickly. Adjust the amount of liquid for the syrup according to the amount of quince you use. PER SERVE: energy 808 kJ (193 cal); protein 1 g; fat 0 g; saturated fat 0 g; cholesterol 0 mg; carbohydrate 46 g; fibre 4 g; calcium 16 mg; iron 0.3 mg; sodium 19 mg.
Sue Radd is one of Australia's leading nutritionists and health communicators. She also advises law firms, providing expert nutrition reports for use in court cases.